In the wake of a devastating hurricane, helping hands are crucial in the effort to restore homes and families back to normal. But the impact of a hurricane isn’t always limited to physical destruction. Following a disaster, many children will have seen things they likely hadn’t before -- anxious parents, damaged buildings, lost toys and pets, or even severely injured people. As a result, their emotional state may temporarily become more fragile, says one child expert. 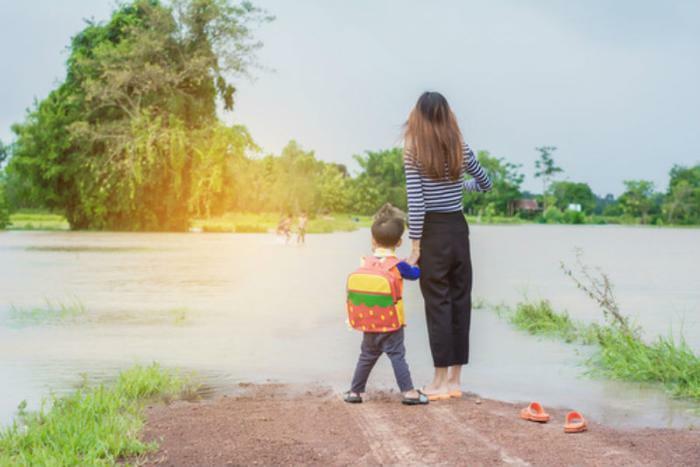 "Compared to adults, children suffer more from exposure to disasters, including psychological, behavioral, and physical problems, as well as difficulties learning in school," said Jessica Dym Bartlett, a senior research scientist at Child Trends, in a recent blog post. Patience, compassion, and sensitivity are key when it comes to dealing with children who may have been rattled by the recent hurricanes, says Dym Bartlett. "Understand that trauma reactions vary widely. Children may regress, demand extra attention, and think about their own needs before those of others -- natural responses that should not be met with anger or punishment," she said. Even simply seeing images on television or hearing about a disaster can cause some children to develop symptoms of post-traumatic stress disorder, depression, and anxiety, she explained. “Psychological impacts on children are particularly likely to reverberate after a disaster,” she added. But with the aid of a nurturing adult, children can work through any negative response they may be experiencing in the aftermath of the recent hurricanes. Create a safe environment. Make sure kids’ basic needs -- such as shelter, food, and clothing -- are met. Keep to regular schedules to provide kids with a sense of safety and predictability. Keep kids busy. Boredom can intensify negative thoughts and behaviors, says Dym Bartlett, but having kids play and interact with others can help keep distress at bay. Limit exposure to potentially jarring images. Media and adult conversation can sometimes include vivid images and/or descriptions of the disaster. Make an effort to shield children from these images. Talk to them. Be available to talk with children about what they see and hear. Be sure to emphasize hope and positivity. Find ways kids can help. "Find age-appropriate ways for children to help. Even very young children benefit from being able to make a positive difference in others' lives while learning important lessons about empathy, compassion, and gratitude," Dym Bartlett said. Get professional help. If a child has been grappling with a negative response to the disaster for more than six weeks, seek professional help, the National Child Traumatic Stress Network recommends.